Just to warn you – if you only like Metal music, skip this album. However, if you’re a bit open-minded or crazy enough to stay and listen to it, I admire you. Let’s start. IGORRR are a rising name in the current musical landscape, and I must admit that I only got to know them through their new album (the one I am going to write about), so let’s say that it has only been two months that I have been familiar with this really weird yet incredibly talented band. The mastermind behind the entire thing is Gautier Serre, the man who is responsible for most of the instruments in general and of course on “Savage Sinusoid” which is the new album’s title. Members also include Laure Le Prunenec and Laurent Lunoir, both taking on the role of vocalists, and lastly, though no less importantly, Sylvain Bouvier behind the drum kit. It might be a bit weird and extraordinary to jam this band, but if you’re truly a fan of music, I think you won’t be having any issues with getting into them. 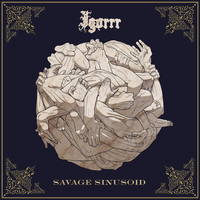 Considering how experimental and groundbreaking they are, it would be really hard to describe the music of IGORRR, but in short, it is a mix between Breakcore, Trip hop, Death Metal (and other Metal subgenres), baroque music and lots of electronic stuff. It’s hard to comprehend, yet easy to listen to. The band started off with “Poisson Soluble” and later on released albums such as “Moisissure” and “Nostril”, and also “Hallelujah”, which was my personal favorite and an album that was the key in getting into the band’s sound. Later on they released “Maigre” and of course this year marks the release of “Savage Sinusoid”, released through Metal Blade Records, which is a thing to admire. The album consists of eleven tracks, mostly with French titles, but the album itself is incredible. It travels with you to another world, a world not only made of music but a world made of art, imagination and fantasy. Listening to the songs such as “ieuD” or “Opus Brain” you can truly hear the flow of music. “Problème d'émotion” is also a great song to get into, but most of the songs are experimental to the fullest, containing influences from all sides of music and genres that I’d mentioned previously, all categorized and randomly resolved in songs; still somehow in a beautiful order. Still, this is an amazing album and it totally deserves my final rating.